After typing the scripture above, I’ve found myself sitting quietly for a few minutes taking it all in. There is too much in this passage to do all of it justice in one blog post. As I think through the four signs that Pastor John highlighted from this passage (Eschatological, Christological, Revelational, and Redemptive), and the words in the passage itself, I keep coming back to “darkness covered the whole land”. What must that have been like–three hours of darkness in the middle of the day? For those at the crucifixion, and for those at home completely unaware that a significant execution was taking place, what was going through their minds? Was it like heavy cloud cover, or did if feel more supernatural in nature? Was it scary? I recently finished Barbara Brown Taylor’s beautiful book Learning to Walk in the Dark. There were a lot of things that I treasured in that book, but the point she made that I keep finding myself coming back to is the stark difference between what she calls “Solar Christians” and “Lunar Christians”. I’m going to be paraphrase here and interject my own interpretations of what she wrote, but she said Solar Christians are afraid of the dark. They try to avoid it at all costs, they interpret dark as “bad”, and try to either ignore it or explain it away using spiritual terms. Lunar Christians, on the other hand, embrace cycles in life, including the dark ones, realizing that just like the moon has cycles, so do our lives. Some seasons are bright, like the full moon, some dark, like the new moon, and others that happen in between those extremes. Taylor also pointed out, (and this blew my mind), that the new moon phase (when there is no moon in the sky) lasts for three nights, and then light begins to appear. She equated that to a constant cycle of death and resurrection. I had never heard that before. I looked it up and learned that depending upon one’s location in relationship to the horizon, sure enough, there are three moonless nights. Three nights when we can’t see the moon reflecting the sun’s light. Three–what a significant number. And on the fourth night light begins to appear. Death. Resurrection. Every month. We don’t always know what to do with the dark. It doesn’t feel safe. But just as God is in the light, God is in the dark. God is never absent–including that dark day when Jesus hung on the cross. There is an interpretation of these events, especially when Jesus cries out “My God, my God, why have you forsaken me?” that teaches God abandoned Jesus in this moment of his deepest need. It goes something like this: God can’t look on our sin, so as Jesus bore our sin on the cross, God had to turn away. There are two problems with this interpretation. 1: Jesus is God. 2: It’s absolutely inconsistent with the character of God that we see throughout scripture. What was God’s response when Adam sinned and hid from Him? God sought Adam out. When Cain killed his brother, God showed up and even put a mark on Cain to protect him from harm. In the New Testament, Jesus was in trouble with the religious leaders all the time because he hung out with “sinners”. The father of the prodigal son ran to his son, embraced him and threw a party. Romans 5:8 tells us that God clearly shows and proves His own love for us, by the fact that while we were still sinners, Christ died for us (Amp). God is not distant from our stories, from our weaknesses, from our sin. He meets us in the middle of our mess and says “I love you.” His very nature and character is love. Always. So if God did not abandon Jesus on the cross, why did Jesus say that? You who fear the LORD, praise him! All you descendants of Jacob, honor him! Revere him, all you descendants of Israel! For he has not despised or scorned the suffering of the afflicted one; he has not hidden his face from him but has listened to his cry for help. All the rich of the earth will feast and worship; all who go down to the dust will kneel before him— those who cannot keep themselves alive. 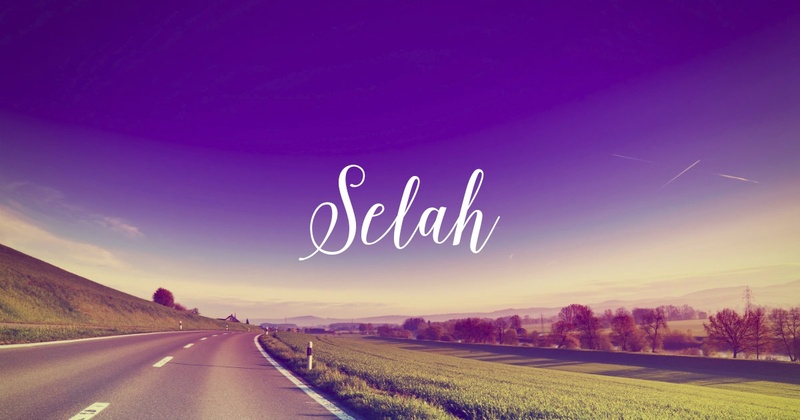 Jesus cried out the first line, but had no strength or breath left to finish the Psalm; he died shortly after he gasped out those words, but it was enough. It was enough for those in the crowd who knew the Hebrew scriptures to know what he was saying. Without a doubt the religious leaders who were present knew that Psalm. Could Jesus have once again been inviting them in? Was the crucifixion dark? Absolutely. I can’t imagine what Jesus was experiencing, what his followers were experiencing. The women who showed up, who loved Jesus dearly—what was going through their minds? The disciples who ran, hid, feared–what was going through their minds? They could not see what we now know–resurrection was coming. All they knew in that moment was darkness–physical darkness, spiritual darkness, and emotional darkness. Darkness. In the Genesis 1 creation account, darkness was present. God created light and separated light from darkness. He calls both light and darkness good. He does not call darkness bad and light good. They both have their place and their purpose. In the Passover account recorded in the book of Exodus, God’s salvation happens during a dark, scary night. In Matthew 24 when Jesus talks about the end of time, he says that after the sun goes dark, then will appear the sign of the Son of Man (v. 30) . And on that day, that crucifixion day, while the sun was hidden for three hours, God’s love and presence were on full display in the dark. I don’t love dark seasons, but in my darkest seasons, I’ve learned that God is present in a different way. In my solar seasons, I see him and his glory in everything around me, and it’s easy to be awestruck by him. In the dark, I don’t see as well, yet he is there. He shows up. He sits with me. He grieves with me. He hurts with me. He suffers with me. He loves me. He transforms me. There are treasures in the dark. There are riches in the dark. God is there, in the dark. And when the dark season ends, I know Him better than I did before. As I type these last words, the sky is just beginning to indicate that dawn is on the way…dark, light, death, resurrection, seasons, cycles– our forever loving God is with us in them all. What comes to your mind as you read that word? My thoughts circle around what occurred in our home last night. One of my sons was up several times, scared with no solid explanation of why. This is not an unusual occurrence in our home. This boy of mine has always hated the dark. He used to have nightmares that would lead to him screaming in his sleep and waking up only partially, then not remembering the event at all when morning came. Over time, he has come to expect to be afraid at night. He tries to fall asleep before the rest of us, because if he is the last person awake in our home, fear overtakes him. He is most afraid of being alone. Last night was no different. The only part of his fear that he can put words to is the fear of being alone. I don’t know why this makes him afraid, but to him, it’s very real. In the middle of the night, to him, it is his truest reality. His stomach contorts in pain, his heart races. He has tools, things we’ve taught him to help him get through the overwhelming fear, but in the dark, he feels powerless to overcome what he is most afraid of. He has become accustomed to the presence of fear when darkness falls. And he has been, by the voice of his own fear, conditioned to believe lies about what darkness means. They both have their place and their purpose. Both. Not one or the other. Both. We humans struggle with “both”. We live in an either/or, right/wrong, good/evil, dualistic culture. This makes faith more than a little difficult… Because faith, to qualify as faith, includes believing in what we can’t see. Yet, we’ve attempted (‘we’ being all of us, the whole of humanity, especially those who would identify as followers of Jesus) to explain the unexplainable, to define the mystery, to understand what is beyond our minds’ capacities, and to fit it all into a neat, tidy box. We’ve sealed the box so that nothing old can get out and nothing new can get in. The box is marked with words like “truth”, “right”, “perfect”, “inerrant” and it’s contents include rules and laws built upon the interpretation and understanding of those who constructed the box. One thing that made it into the box is light. One thing that didn’t is darkness. Our theology of darkness is a lot like my son’s fear of it. We have been conditioned to believe certain things about it, what it represents, why we should fear it. We have learned to think of it as the opposite of light rather than the companion of light. A dance partner, if you will. Light’s perfect pairing. Instead of seeing the place and purpose of each, we’ve labeled one good and one bad. One safe and one dangerous. One represents God, and one represents evil. Like my son, I was afraid of the dark as a child. In fact, I was afraid into even into early adulthood. As I grew in my understanding, though–and began to heal from childhood wounds–my fears dissipated. I am no longer afraid of the dark, and in fact rather enjoy sitting in the dark now, because it allows me to see differently than I do in the light. I am afraid that our theology of darkness, as a whole, has not grown from our first, childish understanding. Our either/or, good/bad mindset kept darkness out of our box and launched us into what Luanne wrote about above–solar Christianity. We’ve lived “in the light”, and it has cost us. If we have never learned how to see in the dark, we will live inside our box of light and miss all that darkness has to offer. We can choose this–and be completely and totally loved and held by God, in our ignorance and unconsciousness. God doesn’t require that we make room within our theological boxes for darkness in order to accept us or love us fully. He doesn’t have a checklist through which we can earn his love. He just loves. Because he is love. We get to be exactly where we are and we can be fully guaranteed that the heart of God is full of love toward us. But–what if there is so much more to God, to life, to our own journeys, than what can fit inside that box? What if there are vast expanses to explore, adventures beyond our wildest imaginations–if we would just get out of the box? Until the darkness somehow gets in. Until it crashes in around us and we either have to face it, or run the other way. If we have the courage to face it, to stop seeing it as the enemy, but rather an opportunity to experience God anew, we’ll see things we’ve never seen before. Our right/wrong, us/them, either/or ways of seeing the world will begin to fall away, and the ability to see with a both/and perspective will begin to grow. We’ll begin to see the beauty of mystery and learn to be more at peace with our partial understanding. We’ll begin to see beyond the surface of things, beyond how they appear. I’ve strayed a long way from the message we heard on Sunday… I didn’t know my words would walk me in this direction today. But I’m grateful I was led here. Because when I sat down to write, I had no idea where I was going. I read over my notes, studied multiple scriptures, looked up some Greek words. I read no less than six or seven different articles and commentaries related to this week’s passage. For three hours. I was up at 4:30 a.m. today, hoping to have this written and published by 6:00. Instead, I found myself drowning in opinions framed as certitudes, fear–and shame–based theology, and assumptions presented as facts. All were sure of their rightness and everyone else’s wrongness. It was a showcase of dualism. Not one of the authors I came across was willing to admit that there could be other correct interpretations, other ways of seeing. Not one admitted that sometimes there is no black and white explanation or that we can’t always understand the ways of God. All of their explanations fit nicely into the safe box. I was exhausted and frustrated before I typed my first word. My morning had been full of prayers for direction, guidance about what to write. And I stopped again to pray–with a heavy sigh–for inspiration from the Spirit. It was at that point, three hours in, that I thought about my boy and his aversion to the dark. How he’s learning to navigate the rugged terrain of his own fear, and how his beliefs about the dark aren’t yet well-informed, but he’s getting there. Right now, he equates darkness with what scares him most. Eventually, I hope he’ll move from this understanding to one that allows him to befriend the dark, to find peace in the quiet of being alone with his thoughts. But that day is not today. I can’t help but think about the darkness that Luanne wrote about, the darkness that crashed in around the cross during the crucifixion of Jesus. For whatever reason, I had always pictured the darkness happening as Jesus breathed his last. That as he died, the skies went dark and the earth shook and the curtain of the temple was torn in two. But according to Matthew, Mark and Luke and their accounts, that’s not how it happened. Darkness fell while Jesus hung, alive, on the cross. In the middle of the day, darkness came and obscured what those present could see. I wonder how dark the darkness was? Could the women who were there still see Jesus in front of them? He was still with them physically, yet their ability to see him was diminished in the dark. I wonder if they felt alone in the dark, the way that my son does… Jesus was very much with them, but could they sense his presence in the dark? Three hours later, the darkness broke. Light returned. The scene was illuminated once again in the light of day. And it’s here, in the light, that Jesus cried out and breathed his last. He died in the light. The eyes of all around him witnessed his last moments in broad daylight. Why did I always assume Jesus took his last breath as darkness fell? Because, I think, for as long as I can remember, I’ve associated darkness with death. And life with light. We know that faith is confidence in what we cannot see, yet we live according to what we can see. Where do you believe Jesus is? These words are from the video that introduced our new series. We’re staying in the book of Mark, but now we’re looking at the end of Jesus’ life and ministry. The goal of this series is to show us what love looks like. But before we look at what love is, we have to see what it is not. We picked up the story in Mark 15:1-20, with a quick glance back to 14:61-62. In these verses, we see Jesus questioned by the high priest before all of the gathered religious authorities reach their decision about him. He is then handed over to Pilate for questioning, and, before the end of the passage, sentenced to crucifixion. The malice of the chief priests… We saw the religious leaders gathered at night, initially, but no decision could be made at night, according to their laws and codes. So they waited until “very early in the morning” to declare what they’d already decided to do with Jesus. But their code-keeping stopped there. Their anger toward Jesus caused them to rewrite codes that they lived by in the moment. They managed to twist the charge of blasphemy (which was not grounds for execution) into a charge of treason–an offense punishable by death. And we see them act immediately once they make a decision, rather than waiting the required 24 hours between sentencing and carrying out the sentence. We see throughout the gospels that the religious leaders had been looking for grounds to kill Jesus for a while. They never really found the grounds they searched for, but we see them here, finally overtaken by their hatred, anger, jealousy–and something else we’ll look at in a moment that I believe might have driven these more obvious emotions. It appears that part of Pilate’s decision to leave Jesus’ fate in the crowd’s hands had to do with his belief that they would surely choose his release over that of a known insurrectionist and murderer, the one called Barabbas. See, it was the custom for him to release a prisoner that the people requested during the Feast each year. Before they made their request, they were stirred up by the chief priests. It ended up that the crowd didn’t want Jesus–they surprised Pilate by, instead, asking for Barabbas. With this knowledge, it makes sense to assume that the priests stirred the crowd by playing on their political leanings. It is the fastest way to get a rise out of people. We experienced this as we listened to Pastor John on Sunday… He asked us to listen to him describe a few things and rate where our reactions landed on a 1-10 scale. He began by talking about spiritual things, the activity of our church and such. We were attentive as we listened, but the reaction landed within the lowest numbers on our scale. He moved to talking about personal things, how we feel when someone speaks negatively about who we are, our physical attributes and such. This topic moved us up the scale, but not too much. Now, imagine the crowd standing before Pilate being reminded of the nationalistic hope Barabbas represented. Perhaps they contrasted the direction Barabbas wanted to take their nation with the kingdom Jesus talked about bringing–an upside-down, inclusive kingdom that looked nothing like what they expected their Messiah would establish–where the last would be first and the meek and marginalized would be blessed. Could this have stirred them up? Absolutely. Because, once again, they preyed on something that lived beneath their outward fury, something that drove them–whether they knew it or not. The “humor” of the soldiers… This group tortured and humiliated their prisoners. They represented the military might that people believed then–and believe still–was necessary to establish a kingdom. They replaced their humanity with humor as they mocked and mutilated Jesus. Once again, I believe there was something else driving them. So what is it? What is this thing that I’ve eluded to in every character I’ve described? The chief priests and all of the other religious leaders saw what was happening as Jesus taught. His following grew, the loyalty of many was shifting from them and their laws to this new way that Jesus introduced. They heard him speak about establishing a new kingdom–one that threatened their power and control and everything they held dear. He introduced a new way of thinking, a way of living that they had never done before. If Jesus took over, everything would change. Do you think it’s a stretch to say that this stirred up their fears? How do we feel when the way we’re used to living is threatened? Is anger our first response, or is it driven by deeper fears? Pilate appears to be fairly nonchalant during the whole process. But I don’t think he was–not really. His position and his own well-being depended on him keeping the Jews he presided over quiet. It’s why he moved closer to them during Passover. If he failed to put out the fires that started among them, he could be removed from his post…and worse. So, while he disagreed with the crowd’s decision, he knew that agreeing to do what they asked would appease the earthquake of their emotion, and maintain the “peace”. The crowd… We would be wise to see ourselves in this group, though we might also identify with the religious leaders who were so afraid of change. When the chief priests stirred up the people, they were preying on their fears first. Their fear led to their fire and fury. Fire and fury is never the starting point. It is an expression of a deeper emotion. Sometimes, it is loyalty or love that leads us to anger. In this case, however, I believe the culprit is fear. The chief priests were not fans of Barabbas. He was a rebel, a problem. But not as big of a problem for them as Jesus. And they knew that they could work with what he stood for, and use it to provoke the emotions of the people. Jesus threatened the belief system that their lives were built upon. His new way felt, to many of them, like a betrayal of the religion they held dear, and of them as a nation. Because Jesus’ allegiance was not to Israel. His way would bring a new kingdom in an upside-down way–he was a threat to those who built their lives on power, success, and control. They were afraid. And the fear of the leaders certainly inflated the fears of the people. Anytime a leader operates out of a place of fear, it influences their followers–especially those most loyal to them. Lastly, we have the soldiers. They had a job to do. A terrible job. Not doing any part of the job they were given would have cost them. Part of their job included carrying out executions. Maybe these men were bloodthirsty sadists who actually delighted in the taking of life. But maybe they weren’t… Maybe they were people who bore the image of God the same as everyone else–including the criminals they had to kill. Maybe they were afraid of what would happen to them if they didn’t carry out their orders. Maybe they were afraid that if they didn’t trade their own humanity for tortuous humor, they wouldn’t be able to carry out the inhumane act of taking life from another human being. I’ve known many soldiers throughout my life. I’ve never known one who doesn’t deal with some amount of fear, no matter how brave and strong they might be. I have to assume these soldiers who mocked and humiliated Jesus also dealt with fear. Why did I spend so much time talking about fear? Because it’s dangerous. Because it changes how we see, it drives our decisions, and it robs us of our humanity when we let it overtake us. We cannot see the image of God in another–or in ourselves–when fear steers our ship. It leads to blind hatred without reason, and it changes us at our cores. It feeds on our vulnerability and grows like a ravenous weed in the soil of our souls. It leads us to say and do the unimaginable. We’ve seen how, over the last few years, fear of the “other” has led to growing hatred and violence in our own nation. Fear is powerful. But there is a place where fear can’t live… something that drives it out. Every. Time. Pastor John’s sermon, and Laura’s post above took a familiar passage and broke it down causing us to have to take a closer look. Most of us are familiar with this account of Jesus before Pilate. Nothing in the story was a surprise to us, but like we do with many familiar things, we read it from a detached place. The way that Pastor John broke it down made it impossible to stay detached….and it happened when he mentioned politics. Laura asked Why does politics have the power to stir our hearts and passions more than spiritual matters? It’s worth thinking about, and answering for ourselves. What is our religion, our faith, our loyalty most connected to? Where have we colluded with empire to the point where nothing riles us up as much as political matters do? These are good questions to sit with. What are your initial reactions to political things? If anger comes up frequently–why? When I was in counseling a few years ago, my counselor pointed out that anger is often a secondary emotion and that underneath it is typically fear or sadness. We don’t often take the time to get to the underlying emotion because anger feels more powerful. Power can be addictive, yet Laura pointed out above that the power of the Religious Leaders, Pilate, the crowd, and the soldiers was actually a cover up for their fear. Uninvestigated anger, and uninvestigated fear leads to violence. As I was listening to the sermon, I found myself wondering who I am in the story. I think that’s a good exercise for all of us. We each have within us the capacity for tremendous good, or evil. Sometimes we don’t recognize the evil for what it is, and because of our human nature, we typically like to paint ourselves in a favorable light, but we must be willing to look at ourselves truthfully, see those areas that are not in line with the character of Jesus, and lean into the Holy Spirit’s power to be convicted, counseled, and led into truth. Are we the religious leaders? Have our traditions led us to a place where there are concrete barriers around our understanding of faith and of God, and anything outside those barriers is a threat to the foundation upon which we’ve built our lives? Are we Pilate? We, like Pilate, can see that Jesus is unlike anyone else. We know deep within ourselves that to really follow Him will cost us something, and we’re not willing because we’d rather please our leaders and our crowd, yet at the same time we try to excuse ourselves from any responsibility in that decision. Are we the crowd? Have we become followers of humans rather than followers of Christ? Have we fallen victim to “group think” which is defined as “a pattern of thought characterized by self-deception, forced manufacture of consent, and conformity to group values and ethics”(Miriam Webster Dictionary)? There is much published material about “group think” and one of the characteristics is that it leads to irrational or dysfunctional decision making. People who fall prey to “group think” make group decisions without critical evaluation of different view points; they believe that whatever decision their group makes is the right decision, even if they have questions, they don’t feel like they can bring up a dissenting view point and therefore they justify the behaviors of whomever they are following in order to feel less inner conflict. Group think is easy for all of us to fall victim to, which is why it is so very important that we follow the advice of Jesus’ brother James who says “if any of you lacks wisdom, you should ask God, who gives generously to all without finding fault and it will be given to you…Everyone should be quick to listen, slow to speak and slow to become angry, because human anger does not produce the righteousness that God desires.” (James 1: 5, 19-20). We never see in Jesus’ ministry that He was “mainstream”. We must be willing to evaluate ourselves. Are we Barabbas? Have we tried to force our nationalistic beliefs into becoming reality? Have we been willing to use or justify violence as a means to an end? Have we usurped the role of God and His ways and His timing in order to make anything “great again”? Have we viewed ourselves and our interests as superior to those of other image bearers? Have we lost our minds and hearts to nationalism? Are we the soldiers? Whether the soldiers enjoyed what they did or not, they were quite obviously detached from seeing the image of God–the value, the divinity, and the preciousness of their victims. Whether they detached themselves as a means of self-protection, or sheer contempt because they thought they were superior, it did not appear to bother them to laugh inappropriately as they inflicted pain. 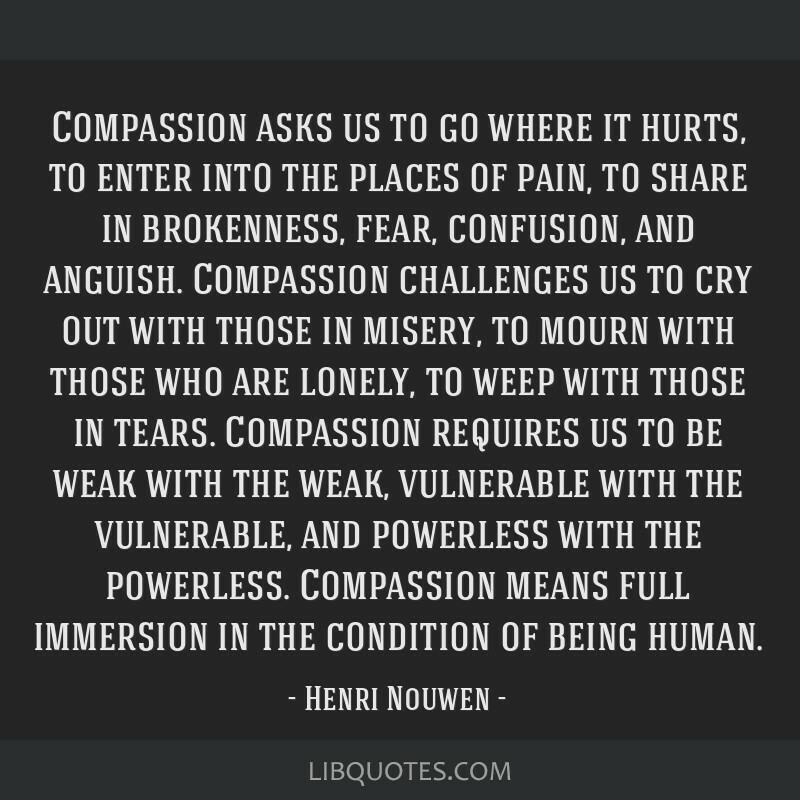 What is our response to the pain of others, especially those who are different from us? Do they deserve it? Are we able to detach ourselves emotionally? Are we able to see the unique image of God in others? Do we value every human equally? Are we Jesus? Jesus who didn’t fight back against the system–the earthly system. Jesus, who didn’t defend himself. Jesus who could have wiped everyone out in an instant and made himself King. (Remember the temptations at the beginning of his ministry?) Jesus who could have chosen earth’s violent corrupt ways, but instead chose the crazy way of unconditional love. 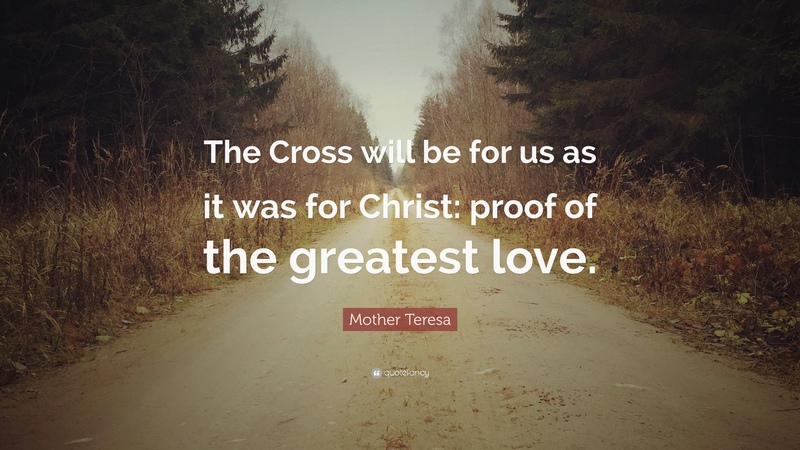 Clare of Assisi…saw in the tragic death of Jesus our own human capacity for violence and yet, our great capacity for love…Discovering ourselves in the mirror of the cross can empower us to love beyond the needs of the ego or the need for self-gratification. We love despite our fragile flaws when we see ourselves loved by One greater than ourselves. In the mirror of the cross we see what it means to share in divine power. To find oneself in the mirror of the cross is to see the world not from the foot of the cross but from the cross itself. How we see is how we love...” (Delio, Making All Things New). I have pictured myself many times at the foot of the cross. I have not, until this morning, pictured myself looking out from the cross. It changes everything. If I have been crucified with Christ (Galations 2:20), the vantage point of the cross is one I need to look through. We know that Jesus was looking at the crowd, the soldiers, his mother, his friends, all of them with love–with grace–with all encompassing forgiveness–no malice, no grasping for earthly power, no harsh words–just love and a desire for each one to be forgiven. Wow. Is that how I see? Is that how I love? We can all be any of the human characters in Mark 15, it comes naturally. We absolutely can’t “be” Jesus in our own strength, but we have everything that we need in the Holy Spirit to live with godliness (2 Pet. 1:3). It’s His gift to us. May we seek the face, the wisdom, the ways of Jesus and look at those around us from the vantage point of the cross choosing to be instruments of peace in an incredibly divided world.